Stars: Ryan Reynolds, Josh Brolin, Morena Baccarin, Julian Dennison, Zazie Beetz, T.J. Miller. WHEN Ryan Reynolds hit the big screen as Deadpool in 2016, it gave the world a new kind of superhero, one with an R rating. In a role he seemed born to play, Reynolds delivered what was probably the funniest and to date, the most violent of movies in the Marvel movie series. Taking in $783m around the world, a sequel was quickly announced and here we are just two years later ready to don the red Spandex and deliver action with a plethora of profanities. Deadpool 2 gets straight into the action in what feels like the first 20 seconds and after a breathtaking collage of what our wisecracking vigilante has been up to, it leads in to a credit sequence that is so clever you'll think you're genuinely watching another popular movie franchise. Wade Wilson (aka Deadpool) finds himself at X-Men headquarters (I won't say why as it would be a spoiler), and is asked to help as a trainee in a police incident at an orphanage for mutant children. 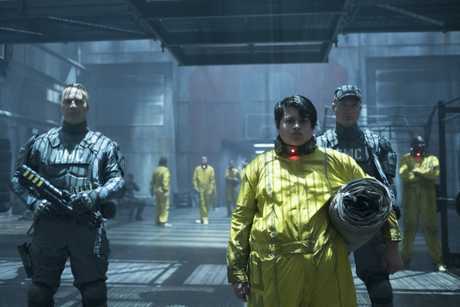 There he meets Russell (Julian Dennison from Hunt For The Wilderpeople), a 14-year-old boy with incredible powers who can unleash fire from his hands and calls himself Firefist. He even gets to keep his Kiwi accent, which is a nice touch. Things soon get out of control and, under arrest, Deadpool finds himself without his powers in a prison with the boy surrounded by the worst mutants imaginable. Enter the villain Cable (a ripped Josh Brolin) who breaks into the prison using a range of futuristic weapons and is intent on killing the teenager, no matter the cost. What follows is a battle between Cable and Deadpool over the boy, which means you're treated to a good old-fashioned prison breakout, a truck chase, a multitude of explosions, dozens of slo-mo near death moments and a finale involving a multitude of super powers. The highlight of Deadpool 2 is a terrific set piece when, after Deadpool assembles his own 'X-Force', the team parachutes in to rescue Russell from a high-security transfer truck that Cable has in his sights. It's possibly one of the grossest, yet hilarious action pieces you'll ever see, and if it doesn't make you laugh out loud then then you're watching the wrong movie. When it comes to the gags, nothing and nobody is off limits. It's impossible to keep up with the digs at everything from DC Comics to John Wick and James Bond, while Deadpool continuously pokes fun at himself and delivers lines straight to camera. There are so many laughs in this movie you'll miss the next one - they come that fast. Reynolds is credited with two other writers for this sequel, which gives you a good idea how attached he is to the character. As for the biggest laughs it depends how much of a Marvel and X-Men fan you are, as the post-credit sequences left the audience I saw it with in hysterics. The laughs come thick and fast, the action is everything you would expect from a Marvel movie with several quality set pieces, yet at the heart of the movie it retains a tale of a superhero facing loss, questioning his motives and his own mortality. Structurally, Deadpool 2 feels like a less complete journey this time round and seems to lose some direction, but it's so entertaining you don't really care. It is a darker movie than the last one, at times asking you to take things seriously. Brolin is an excellent villain, and the cast of supporting characters like Domino, Bedlam and Shatterstar are all solid in their roles. We go to the movies to be entertained, and Deadpool 2 delivers just that. Sometimes 'more of the same' isn't a bad thing. 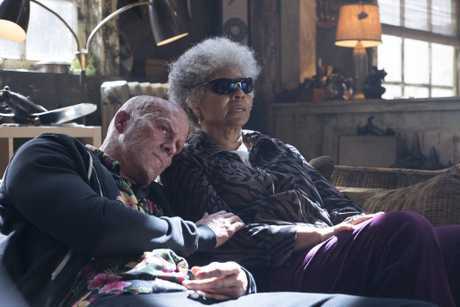 Deadpool 2 is a sequel that knows exactly what its audience wants to see.